There are various applications that pack other tools in their installation packages. The most common ones are browser toolbars, and adware that displays pop-up ads or change your default search engine while you’re browsing the web. Most of the times, these potentially unwanted programs can be unchecked during setup but they can often be hard to notice. ZHPCleaner is a practical tool that can help you clean toolbars, adware, hijackers and other PUPs from your web browser. The application consists of three modules accessible from the main window: Scanner, Repair, and Report. To begin with, you should use the Scanner to detect the unwanted browser elements. Only then, you can use the Repair option to remove the detected malicious software from your browser. For each detected item, you can preview it and right-click on it to view more details before deciding whethere you should remove it or not. 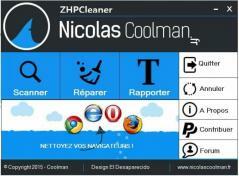 ZHPCleaner’s report module can save the results of the last scan so you can analyze it at a later time.